Sony pulled the cover off their new PRS-505 Reader today, which features a new body, a few new tricks, and a few dressed up old ones. 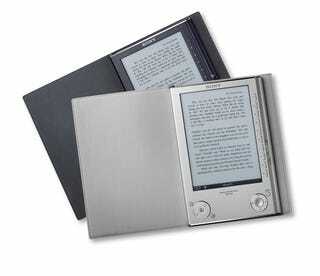 Instead of black, the Sony Reader now comes in silver or dark blue. In addition to the color change, Sony is touting the redesigned button layout, claiming a more intuitive experience—but it mostly looks like they rearranged the existing buttons of the PRS-500 to make them more accessible. And though Sony claims the screen has a higher contrast and faster refresh rate, no exact specs were given. Other new features include a doubling of the internal memory to hold 160 eBooks instead of 80, and a new USB mass storage mode. Old features: battery life still lasts for 7,500 page turns and the Reader also displays PDF, RTF, TXT and JPEG formats like before. SD and Memory Stick slots are also provided for memory expansion. Of course, the PRS-505 works with the Sony Connect store, where there are over 20,000 eBooks available for download. The Sony Reader will hit stores later this month for $300 (cheaper than the initial release of the PRS-500 by $50). SAN DIEGO, Oct. 2, 2007 ⎯ In its version of a literary sequel, Sony Electronics is taking the cover off a new edition of its ground-breaking Reader Digital Book this month. The new Reader (model PRS-505) features a svelte body design and is available in two colors - silver and dark blue. Re-styled controls more closely mimic paper page turns and allow for quick, intuitive navigation. A next-generation electronic paper display delivers faster response and a higher contrast ratio for easy reading even in bright sunshine. Eight levels of gray scale provide for crisp and clear text, images, and graphics. "For people on the go, this device is compelling because it allows them to carry a wide variety of reading materials whether they are on a cross-country flight, in a doctor's office waiting room, or at a beach resort," said Steve Haber, senior vice president of Sony's Digital Imaging and Audio Division. "The Reader can handle a stack of books and other documents that people would rather not carry, yet offers a 'book-like' reading experience unavailable with other electronic devices." With the capacity to store up to 160 typical eBooks, the Reader can act as a mobile library. Expansion slots for Memory Stick Duo™ media or SD memory cards make the device's library potential practically limitless. More advanced users will appreciate the new USB-based mass storage capability that allows them to use the device as a portable drive for the direct transfer of documents, images and other files to the Reader. A new auto sync feature also lets users set up folders with books and documents that can be automatically synchronized when the device is connected to a PC. Since Sony's launch of the CONNECT™ eBooks Store last year, the number of downloadable eBooks offered has expanded to more than 20,000 titles with new ones added weekly. Grove/Atlantic, Harcourt Trade, Kensington, Pearson Education, The Perseus Books Group, Regnery Publishing, Taylor & Francis and W.W. Norton have joined the ranks of publishers such as Hachette Book Group USA, Harlequin, HarperCollins Publishers, Holtzbrinck Publishers, Hyperion, McGraw Hill, Penguin Group, Random House and Simon & Schuster in their commitment to electronic publishing. Recent newcomers to the store include Reader's Digest, the first magazine to produce content for the Reader and Dorling Kindersley with titles coming soon. The site also boasts a number of Rough Guide travel titles. The New International Version Bible by Zondervan® (a unit of HarperCollins Publishers) quickly rose to the top of the eBook store's bestseller list after it was added to the collection last month. And blockbuster authors such as Dean Koontz and Mitch Albom recently debuted electronic versions of their work to an enthusiastic response. For a limited time, when a Reader is registered on Sony's CONNECT eBooks Store, customers will receive a credit good for the purchase of 100 available CONNECT Classics titles, including the works of William Shakespeare, Jane Austen, H.G. Wells and more. "Since launching almost a year ago, we've confirmed that Reader owners are avid book readers and great customers of our growing selection of book titles," said Lee Shirani, vice president for eBooks at Sony CONNECT. "Publishers are responding by making more electronic titles available, and, increasingly by making them available at the same time as print versions are released. "As a result, at any given time, we carry a majority of what's on the New York Times Bestsellers list and our weekly top downloads closely track with the most popular print titles." The CONNECT store offers a broad selection of fiction and non-fiction, bestsellers, well-known authors, classics and more, with rich descriptive content in the form of author biographies, expert book reviews and reader commentary. The Reader's high-resolution electronic paper display delivers a realistic print look that rivals traditional paper and uses minimal power. A single battery charge provides up to 7,500 pages of continuous reading. The option to magnify the text in three sizes offers a distinct advantage for sight-impaired readers. Switching the Reader to landscape mode offers yet another level of magnification as well as a wider page view. In addition to electronic books, the Reader can also store and display personal and business documents in Adobe PDF format (best when formatted for the Reader's display), RTF, text and JPEG images. The new Reader will retail for about $300 and come complete with a USB cable; eBook Library PC companion software; and a color-coordinated, protective soft cover. The Reader and optional accessories such as pink or black leather covers and an AC wall charger will be available this month direct through HYPERLINK "http://www.sonystyle.com" www.sonystyle.com, at SonyStyle® stores nationwide, Borders stores and at authorized retailers across the country. More information about Sony Reader is available online at HYPERLINK "http://www.sony.com/reader" www.sony.com/reader.